SSC IMD Scientific Assistant Result | SSC has published the results and mark lists of Scientific Assistant in IMD Examination, 2017 on the official website of the commission on 13/02/2018. SSC IMD Scientific Assistant recruitment exam results can be accessed from the official website, ssc.nic.in. A total of 4,75,093 candidates had applied for the SSC IMD examination, out of which 1,61,196 candidates actually appeared in the computer-based open competitive examination. This SSC IMD exam was held from November 22, 2017, to November 25, 2017, all over the country for recruitment to Group B Non-Gazetted, the Non-Ministerial post of Scientific Assistant in India Meteorological Department (IMD). 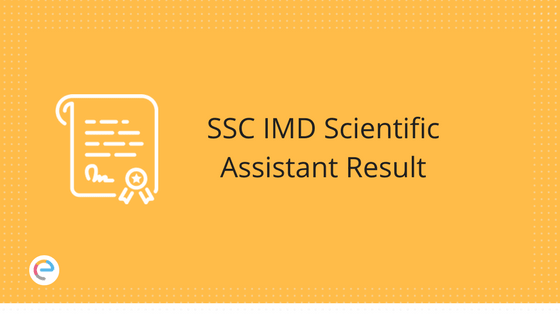 More information regarding SSC IMD Scientific Assistant Result are given below. The aspirants may take a print out of their respective Question Paper(s) along with the Final Answer Keys by using their Roll No, Examination Password and Date of the Examination. This facility will be available for the aspirants up to 24th May 2018. SSC Scientific Assistant result 2017 out. The result for SSC IMD Scientific Assistant has been declared by the IMD for 161196 candidates appeared in SSC Scientific Assistant Exam. Selected candidates have to appear for document verification round. Log in and check your results and marks from next page by using their Registration No./ Roll No. and Registration Password. 3. Once you select a new page will come out in the form of PDF containing the cut off marks of the examination. 5. Finally, take a print out of that list and then keep it secure for further usage. SC, ST, OBC and PH candidates, who are selected on their own merit without relaxed standards, along with candidates belonging to other communities, will not be adjusted against the reserved share of vacancies. If on verification, at any time before or after the written examination, it is found that they do not fulfill any of the eligibility conditions, their candidature for the examination will be canceled by the Commission. Aspirants may keep a close watch on the websites of the Commission, respective regional office and Indian Meteorological Department for further update/information about the recruitment details. We hope this detailed article on SSC IMD Scientific Assistant Result 2018 helps you. For any query related to SSC IMD Scientific Assistant Result or the exam in general, drop a comment below. We will get back to you. All the best! M not able to open my SSC imd result…till now…what should I do??? Generate Password if forgot , then check your mail for password and proceed further. This happened to most as it is not accepting the password mentioned in the admit card. Password is the 4 digit no. that you have gotwith registration id. Generate Password if forgot , then check your mail inbox and spam . My score is 88.75(General-male) in computer science.Is there any chances???? 135 EC gen any chance? 120.25 IT Gen. What are the chances?? And when do think the merit list will be uploaded? I got 114.5 mark in gen cat .is there any chance . i got 92.25 obc category .CSE..is there any chance?? what is the expected date of merit list.. any idea..? 135.5 obc in ece .. what are the chances. Sir, i have 98.5 marks.. ST category… Computer science…. Any chance???? I got 100.75 in Electronics General…what are the chances? sir 13.25 in ece general..is there having any chance? Shally, it will be close call. NOT13.25…..its 50 so is there any chance? 83.75 General Male in Computer. Any Chance? Shortlisted Candidates list will be uploaded when & where? Please keep an eye on the official website. 82.5 in Ex-serviceman category any chance? btech ece 122 …… will they consider btech ???? You have a good chance. Let’s hope for the best. Score is 83.5, SC, Computer science. Any chances? gen ece 119.5 any chance? Hey Dibyendu, you have a good chance. Prasanth, the final result is not yet declared. Scores of computer-based written examination is released last month. 123 UR category ECE any chance??? Hey, borderline chances. Let’s hope for the best. based on latest notification btech guys are not eligible so any chances for me? Pratap, very good chance. Let’s hope for the best. Narendra, you have a decent chance. You have a good chance, Gourav. 119.75 marks in cse OBC…Is there any chance? approx how many btech candidates are there? Is there any chances plz???? i got 92 marks in cs stream under Ex Serv category……..is iany chance……? I got 104 marks in B.Sc. (Physics) under OBC. Is there any chance ??? Chances are less but hope for the best. Chances are very less, we regret to say. any idea of DV dates? sir i completed diploma electronics(3 years) and i did b.tech ece(3 years ). am i eligible ? i got 92 in ece and any chance in SC ? Siva, you’ll have to check from the official website because B.Tech CSE is allowed but there is some ambiguity in the latest notification regarding B.Tech ECE. For confirmation, please contact the IMD official helpline. Sunita, you’ll have to check from the official website because B.Tech CSE is allowed but there is some ambiguity in the latest notification regarding B.Tech ECE. For confirmation, please contact the IMD official helpline. Sir i have got 101..cs…st ..is there any chance. 69 obc BE CS any chance to qualify??? Lingaraj, Chances are very less. Kishor, Chances are very less. There is no information regarding BE B TECH. Please send me the link regarding this. I THINK BE CS IT is allowed. Less chances, but hope for the best. Sir,I have total 66.25 (general) in cs.Is there any chance? Sir,I have total 66.25 (general) in cs..mca graduate..Is there any chance sir? Chances are slim,but hope for the best. You have a decent chance. 110.75 st in bsc physics what are the chances? please tell me…..
sir i have got 115.5 general in physics.. are there any chances?? Sir, 131.5 in physics general category. Any chance? When final result will come ? Are the results declared regional wise with different cutoffs? As far as I know, no, it is not declared regional-wise. 97 marks in CSE(B.TECH) General category..any chances? sir 68 in cs obc category and ladies.any chance? Have you any idea about the official cutoff when will it be release…. ? I got 98. 75 obc category in computer science is there any chance? ? 97 in General CSE any chances? Good chance, Bhuvan. Let’s hope for the best. Decent chance. Let’s hope for the best. 74 in esm category any chances..
Sir , 87.50 in cs st category . Any chance? There are no clear rules about this so please contact the officials directly. Btech not allowed .Please check IMD website , SA clarification document on Home page. It will be available in the official website, ssc.nic.in. some one clarify on this? class 12th with physics and math is necessary. Even if you qualify written exam but in certificate verification they will reject if your not 12th with physics and mathematics , same they have done in 2013 sa batch recruitment process. yes, you have good chances. is BE IT allowed for SA CSE? Sir ,101.5 in cs st category .any chance? No, BE CSE too is not allowed. sir 76.5 in Computer science general category. Any Chance? When the final result will be declared? Sir my serial number is 1227 general category 133 mark any hope after brtebe allow ..
Sir, the document verification process has been finished. Can you please inform me what are the further processes in this recruitment process and when we will have our joining? Are the candidates who have gone through the process of document verification selected finally? Please let me inform. those students have allocated state are safe or merited or job ho gaya.. Yes, there is if your marks is more than the cutoff. You can check the cutoff of 2017 below.